Guardian enables you to create and make available proxy auto-config (PAC) scripts which determine which IP addresses and domains to access via Guardian and which to access directly. Guardian supports built-in PAC scripts and custom PAC script templates. 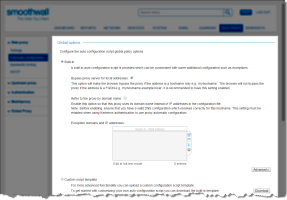 A built-in script is an auto configuration script which you can customize with additional settings such as exceptions. 1. Go to Web proxy > Web proxy > Automatic configuration. • Bypass proxy server for local addresses — Select this option to not use Guardian when connecting to local addresses. When selected, this option makes users’ browsers bypass the Guardian proxy if the address is a hostname only, for example: myhostname. Browsers will not bypass the Guardian proxy if the address is a fully qualified domain name (FQDN) for example: myhostname.example.local. • Refer to the proxy by domain name — Select this option so that the Guardian proxy uses its domain name instead of IP addresses in the configuration file. Before enabling this option, ensure that you have a valid DNS configuration which resolves correctly for this hostname. This option must be enabled when using Kerberos authentication to use proxy automatic configuration. • Exception domains and IP addresses — In this text box, enter an IP address, IP address range, network address or hostname that users may access directly. • Exception regular expression domains — Optionally, click Advanced to access the Exception regular expression domains area. In the text box, enter one regular expression domain per line that users may access directly. would disable usage of Guardian for youtube.com, ytimg.com and subdomains such as www.youtube.com; but not, for example, fakeyoutube.com. A custom script provides advanced functionality by enabling you to use a script customized to suit your organization. Tip: You can use the built-in template as starting point for creating a custom script. On the Web proxy > Web proxy > Automatic configuration page, click Download and save the default script to a suitable location. Edit the file to suit your requirements and save it using a different name. See below for how to upload it. 1. 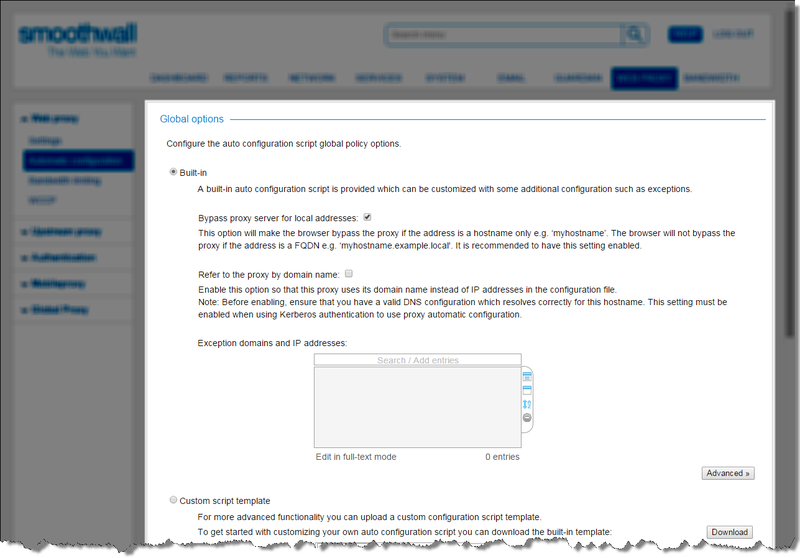 After configuring the custom script, go to the Web proxy > Web proxy > Automatic configuration page. You define the policy for each interface, by configuring which proxy address the configuration script should direct clients to. 1. Go to the Web proxy > Web proxy > Automatic configuration page. 2. In the Manage configuration script area, from the Interface drop-down list, select the address the configuration script should direct clients to.